Newborn Screening Test For ALD Recommended, But Most States Don't Offer It : Shots - Health News There's a genetic test for ALD, the inherited disorder portrayed in the movie Lorenzo's Oil, and the federal government recommends it for all newborns. But only a handful of states offer it routinely. 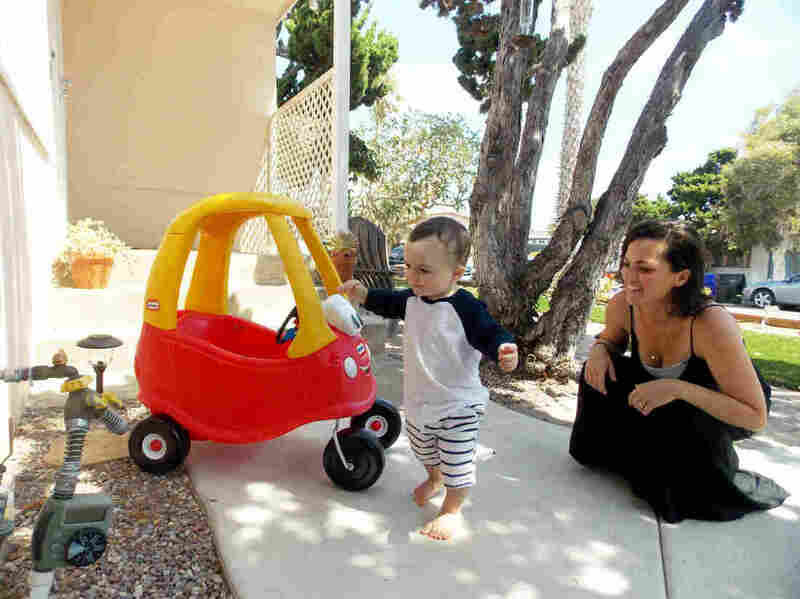 Kerri De Nies plays with her son, Gregory Mac Phee at their home in San Diego. Gregory tested positive for adrenoleukodystrophy, a rare brain disorder that affects 1 in about 18,000 babies. Roughly 30 percent of boys with the genetic mutation go on to develop the most serious form of the disease. Kerri De Nies received the news this spring from her son's pediatrician: Her chubby-cheeked toddler has a rare brain disorder. She'd never heard of the disease — adrenoleukodystrophy, or ALD — but soon felt devastated and overwhelmed. "I probably read everything you could possibly read online — every single website," De Nies says as she cradles her son, Gregory Mac Phee. "It's definitely hard to think about what could potentially happen. You think about the worst-case scenario." ALD is a genetic brain disorder depicted in the 1992 movie Lorenzo's Oil, which portrayed a couple whose son became debilitated by the disease. The most serious form of the illness typically strikes boys between the ages of 4 and 10. Most are diagnosed too late for treatment to be successful, and they often die before their 10th birthday. The more De Nies learned about ALD, the more she realized how fortunate the family was to have discovered Gregory's condition so early. 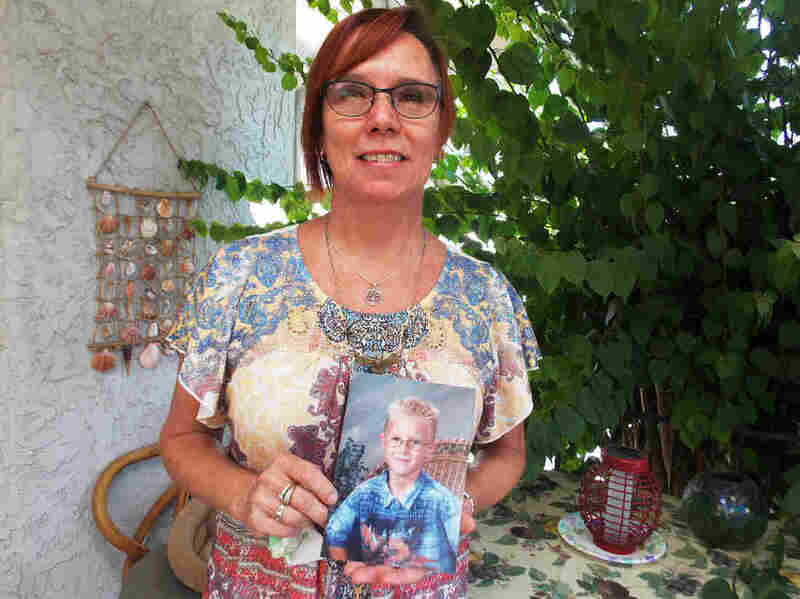 Her son's blood was tested when he was about 10 months old. Gregory — who doesn't have any symptoms — will get his first brain MRI when he turns 2, and again every six months after he turns 3. If a scan shows changes that indicate he has the serious form of the disease, he'll likely then get a bone marrow transplant. That can stop ALD in its tracks. "If you pick it up in the early stages," Eichler says, "you are at a much better place in terms of treating it effectively." California is one of only a handful of states nationwide that now routinely screen newborn infants for the disease — a test that dramatically increases Gregory's chances of survival. "Listening to families and their ordeal gives you a real sense of what this has done over generations and how much suffering could be prevented through the screening program," he says. Janis Sherwood, who lives in Vista, Calif., lost a son to ALD in 2003. She's now lobbying to have more states include the ALD test in their routine genetic screening panel for newborns. As California collects data on how the boys do in treatment, she says, other states will likely follow. "It's mind-boggling that not every state is testing," says De Nies, who teaches children's ballet in San Diego. "Families will not know until it could be too late for them." Janis Sherwood says that since her son Sawyer's death from ALD in 2003, she has felt an urgency to educate doctors, families and others about the disease. "I mean you don't prepare for that," she says, "especially when they say there is nothing that could be done. Take him home and make him comfortable." In the last few years, she has turned her attention to lobbying states throughout the nation to adopt newborn genetic screening for ALD. She believes that as California collects data on how the boys do in treatment, other states will follow. "I think that we are going to see a domino effect as we get more states on board," she says. About one in every 18,000 people have ALD. Of boys with the genetic defect, about 30 to 40 percent will develop the life-threatening form of the disease, which leads to vision, gait and memory problems — and eventually death. The illness destroys myelin, the protective surface that surrounds the brain's nerve cells. The earlier the transplant, the better a boy's chance of survival, Sankar says. "The delay may make the difference between whether he can have a life-saving treatment or not." Doctors are also having some success with gene therapy, in which the children undergo a transplant with their own stem cells rather than a donor's, Sankar says. In fact, a study published Wednesday in the New England Journal of Medicine concluded that gene therapy "may be a safe and effective alternative" for treating boys with cerebral adrenoleukodystrophy. The study was based on 17 children with ALD, 15 of whom were doing well two years after gene therapy treatment. Typically around the nation, newborn testing kits cost a hospital or birthing facility about $120, says Dr. Jeff Botkin, chief of medical ethics at the University of Utah. "This is an extraordinarily low cost for this number of tests," he says. The tests are typically covered by insurers or Medicaid. "The major question is whether the condition is treatable," Botkin says. "Many families had to go through sort of a diagnostic odyssey," he says. "It only became clear as they developed progressively worse problems that they had a serious genetic condition." Eichler says that's part of the challenge for clinicians who may not be familiar with ALD: "How do you know when this is a critical brain disease versus just a normal part of development?" Gina Cousineau's son Evan was diagnosed with ALD at age 8 in May 2007, after he came home from swim practice and had a seizure. Though he underwent a bone marrow transplant, Evan died from a secondary infection before he turned 9. "Thank God this newborn screening came into effect," Cousineau says. "Knowledge is power. Had I had the knowledge with my son, Evan, he would be alive today." De Nies says she worries about Gregory's future, but she's confident her son will live a long life. And she's grateful to Cousineau and other mothers whose sons didn't have the same chance. "Without them, we would never know about the gene mutation," she says. "I just feel like they are our fairy godmothers." So far, five states test newborns for ALD. And at least half a dozen others are expected to begin screening soon.